While it may look easy, rigging a load is one of the most dangerous jobs on a construction site. If safety precautions aren’t followed, a poorly rigged load could cause damage to fingers, hands, and worse all throughout the lift. Knowing the correct weight of the load is important on many levels. If a load is too heavy, it could put too much stress on the rigging materials, leading to failure. The load could also affect the operation of the crane. Load charts are very specific for this reason: The heavier the load, the more limited the lifting power of the crane. While it is impossible to pinpoint the exact location of every load, approximating the center of gravity is an important factor on every lift. This keeps the load from shifting during a lift and sloppy rigging work in this regard can lead to serious injury. Many a crew member has been killed when loads have slipped from their original position or came loose during a lift. At the grocery store, you don’t put laundry detergent on top of the bread or a gallon of milk on top of the eggs. The same principles apply to rigging material handling. Make sure the load is evenly stacked with larger materials at the bottom to provide a solid base. Wrapping smaller items together also keeps parts of the load from becoming loose during a lift. Wire ropes, synthetic slings, hooks, and every other part of the rigging equipment should be inspected before every job. Frayed wire or damaged slings could indicate weakened materials. In fact, most nylon slings have a red warning thread inside to indicate an unsafe condition when visible. Get rid of all materials that have the potential for failure. If the rigging has failed once the load is off the ground, there will be no happy outcome. If possible, keep loads a safe distance from larger obstacles. 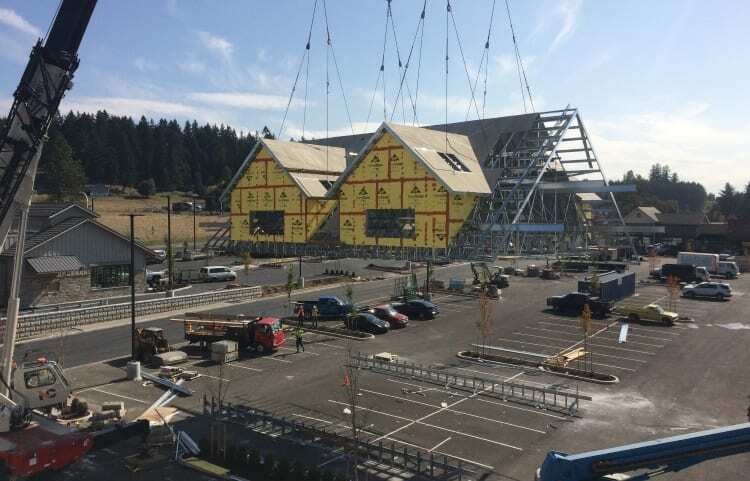 The slightest movement from the crane could swing the load in an unexpected direction and you don’t want to be caught between a 20-ton load and a concrete barrier. Never walk underneath a load or the crane boom for that matter. Be aware of the crane radius and avoid the area after a lift is underway. Other steps of safe work that should be taken include using a designated spotter to communicate with the crane operator, refraining from dragging loads on the ground, and working with a tag line to help guide loads. Rigging a load is a lot more than just hooking it up to the crane. At NessCampbell, we understand the dangers of unsafe rigging and continually train our crews on how to perform safely. Not only could loads be damaged, but people on the ground are also put in harm’s way. If you are in need of rigging services, call us today. We’ll make sure your load, and other workers, are safe every step of the way.